Welcome to The Garlic Queen’s Blog! Note the lesions and neck rot on the pseudostem of this Yugoslavian Porcelain plant. Here is a photo of the pseudostem of a Yugoslavian Porcelain garlic plant. Take note of the lesions and rot near the surface of the soil. We’ve had a particularly rainy and wet spring with few sunny and hot days to dry out. I believe what we’re seeing here is Botrytis porri, a fungal infection of fall planted garlic. 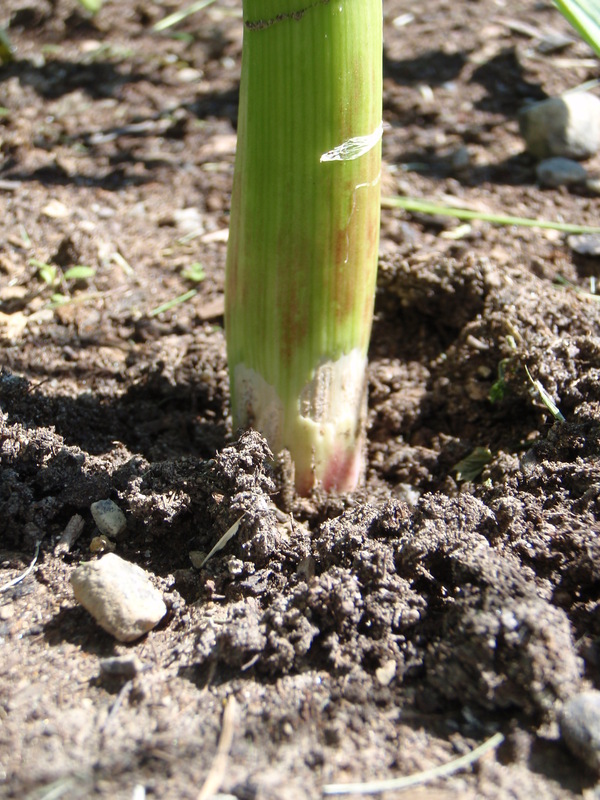 When I harvest this plant, I will be looking for further signs of infection in the bulb. This entry was posted on Sunday, June 16th, 2013 at 11:39 am	and tagged with cultivation, damage, disease, neck rot and posted in Cultivation, Damage, Diseases. You can follow any responses to this entry through the RSS 2.0 feed.